Of all the Republican presidential candidates who have dropped out, Ben Carson is certainly the most gracious towards the nearly-nominated Donald Trump. 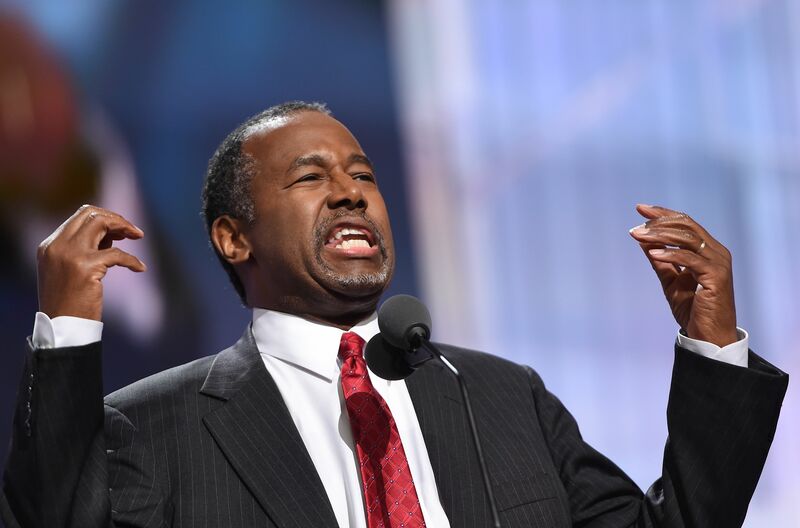 On Tuesday night at the Republican National Convention, Carson gave a speech in which he showed the most personality and energy I've seen from him all year. The former neurosurgeon and one-time candidate had much to say about the state of the Republican Party, and ahead of his speech, he preached party unity. Below you'll find a transcript of Carson's RNC speech, which certainly revved up the crowd who cheered for a solid minute after he walked out on stage. My main thought is that we've got to get people to understand what the stakes are in this election so that they can put their petty differences behind them and concentrate on making sure that we win because the consequences of not winning are not four or eight years of Hillary Clinton. Carson also struck a sympathetic tone towards accusations that Melania Trump copied parts of Michelle Obama's speech at the 2008 Democratic National Convention, saying that if Melania did indeed lift from the First Lady, she did so based on "shared values" that transcend party lines. Thank you, thank you, thank you everyone. I want to thank you all for that very warm welcome. I have to start out by saying one very important thing: I'm not politically correct. And I hate political correctness because it's antithetical to the founding principles of this country and the secular progressives use it to make people sit down and shut up while they change everything. It's time for us to stand up and shout out about what we believe in. You know, I devoted my career to studying and operating on the human brain. This remarkable organ defines our humanity. It gives us the ability to not only feel and observe, but to reason. When we elect a president, we need to use that power of reasoning to look at their history, their character, what kind of people they really are. It's all the difference in the world for us. And it is gonna be so critical right now. We must resist the temptation to take the easy way out and to passively accept what is fed to us by the political elite and the media because they don't know what they're talking about and they have an agenda. We must also be wary of the narrative that's being advanced by some in our own party, the notion that a Hillary Clinton administration wouldn't be that bad, that the effects would only be temporary. That it would only last for four and at most eight years. They're not using their God-given brain to think about what they're saying, because it won't be four or eight years, because she will be appointing people who will have an effect on us for generations and America may never recover from that. That's what we have to be thinking about. Interestingly enough, we have to start thinking about what would Hillary Clinton do if she was, in fact, president. She would appoint Supreme Court justices, she would appoint federal judges, and that would have a deleterious effect on what happens for generations to come. Not only that, but she would continue with a system that denigrates the educates of our young people, puts them in a place where they're never going to be able to get a job, where they're always going to be dependent and where they can therefore be cultivated for their votes. This is not what America is all about, this kind of deception. And this is what we the people have the necessary obligation to fight. One of the things that I have learned about Hillary Clinton is that one of her heroes, her mentors, was Saul Alinsky. Her senior thesis was about Saul Alinsky. This was someone that she greatly admired and that affected all of her philosophies subsequently. Now, interestingly enough, let me tell you something about Saul Alinsky. He wrote a book called "Rules For Radicals." On the dedication page, it acknowledges Lucifer, the original radical who gained his own kingdom. Now think about that. This is a nation where our founding document, the Declaration of Independence, talks about certain inalienable rights that come from our creator. This is a nation where our Pledge of Allegiance says we are "one nation, under God." This is a nation where every coin in our pocket and every bill in our wallet says "In God We Trust." So are we willing to elect someone as president who has as their role model somebody who acknowledges Lucifer? Think about that. The secular progressive agenda is antithetical to the principles of the founding of this nation. If we continue to allow them to take God out of our lives, God will remove himself from us, we will not be blessed and our nation will go down the tubes and we will be responsible for that. We don't want that to happen. Now Donald Trump, he understands this fairly well, he understands that the blessings of this nation come with the responsibility to ensure that they are available to all, not just the privileged few. This is exemplified by his willingness to take on the establishment against all odds. It is evident in his passion for the American worker, it is found in his desire to put his considerable skills to work on behalf of American interests and not his self-interest. I'm proud to support Donald Trump, an extraordinary businessman, the right leader for a time such as this. But you know what? It is not about Donald Trump. It is not about me. It is about we, the people, and Thomas Jefferson said that we would reach this point because we the people would not be paying attention and it would allow the government to grow, to expand, and to metastasize and to try to rule us. But he said before we turn into something else, we the people would recognize what was going on, what we were about to lose, and we would rise up and we would take control of our nation and I say now is the time for us to rise up and take America back.